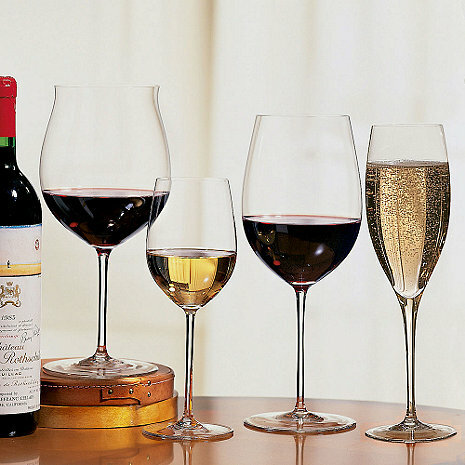 This Riedel Sommeliers Tasters Set includes two of the four most popular Riedel Sommelier glasses for a total of eight wine glasses. Cabernet/Merlot/Bordeaux wine glass recommended for: Bordeaux (red), Brunello di Montalcino, Sangiovese, Cabernet Franc. Pinot Noir/Burgundy wine glass recommended for: Burgundy (red), Barbaresco, Barolo, Beaujolais Grand Cru. Chardonnay wine glass recommended for: Albariño, Bourgogne Aligoté, Bordeaux (white), Burgundy (white), Chablis, Chardonnay, Chenin Blanc, Corton-Charlemagne, Hermitage blanc, Marsanne, Meursault, Pinot (Blanc, Grigio, Gris), Sauvignon blanc (Barrique), Sauvignon-Sémillon (Barrique), Viognier. Champagne Wine Glass recommended for all champagnes. 2 Chardonnay - 8-1/2"H x 2-3/8" Dia., 12-3/8 oz. 2 Pinot Noir/Burgundy - 9-3/4"H x 3-3/4" Dia., 37 oz. 2 Cabernet/Merlot/Bordeaux - 10-5/8"H x 3-1/8" Dia., 30-3/8 oz. 2 Champagne - 9-5/8"H x 2-1/8" Dia., 11-5/8oz. Overall Height: Chardonnay - 8-1/2"; Pinot Noir/Burgundy - 9-3/4"; Cabernet/Merlot/Bordeaux - 10-5/8"; Champagne - 9-5/8"
Mouth Diameter: Chardonnay - 2-3/8"; Pinot Noir/Burgundy - 3-3/4": Cabernet/Merlot/Bordeaux - 3-1/8"; Champagne - 2-1/8"
Capacity: Chardonnay - 12-3/8 oz. ; Pinot Noir /Burgundy - 37 oz. ; Cabernet/Merlot/Bordeaux - 30-3/8 oz. ; Champagne - 11-5/8 oz. BEST ANSWER: The Riedel Sommeliers Tasters Set (Set of 8) should not be placed in the dishwasher. We recommend washing these glasses by hand. I wouldn't risk it. They are very thin & ive broken a couple even tho I hand wash them. No, they are fine hand blown crystal. Hand washing only. Is a protective carrying case available for the stems? At the moment we do not, but we may offer something very soon. Can the. Taster glasses be bought individually? BEST ANSWER: Yes, please see SOMMELIER LINE. Absolutely amazing packaging. Ordering a valuable set of wine glasses like these online was nerve racking when considering shipping damage. No issues or concerns. They will show up pefectly packaged and protected.